The God Man Poem is a unique presentation of the gospel story never before seen or experienced. It is written in a contemporary poetic style and is emotionally interpreted in original colorful abstract artwork. The God Man Poem comes in four formats: gallery version, text-only book version, DVD, and CD. Stan Inouye, Iwa's President and Founder, wrote The God Man Poem shortly after his daughter, Joelle, passed away from Spinal Muscular Atrophy at the age of 16. Writing the poem helped Stan to find the hope and assurance he needed as he grieved over Joelle’s death. After The God Man Poem was written, Yoshi Ishida, graduate of Art Center College of Design and award-winning auto designer, meditated upon one page of the poem each week as a way of centering his thoughts and prayers. As an image would come to mind while meditating, Yoshi pencil-sketched the image that he envisioned. He then photographed various objects and scenes in and around his home to provide himself with a digital palette from which to choose color, shape and texture so they could be combined to recreate the images imprinted upon his mind while meditating. When Ken Horii, Director of Digital Media Design for Disney Imagineering, heard that Yoshi had digitally generated the visual art for The God Man Poem, he volunteered to transform the poem into an animated DVD. Before long, several other friends of Stan, namely Gary Stroutsos, Jennifer Goodenberger and Kenny Elliot, offered music composed and performed by them for use as background music. Friends of Ken and his daughter, Alessandra Horii, provided needed technical support to record and author the DVD. Ken single-handedly mixed voice, music, visual art and motion into a seamless masterful production that adds multiple dimensions to experiencing The God Man Poem. 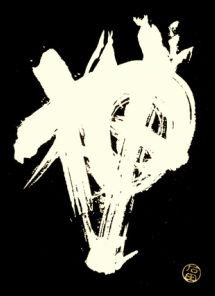 A CD version was an easy next step after the DVD was produced. In the gallery version, the text is artistically arranged on each sheet of vellum, and each sheet is paired with a plate of colorful artwork which lies beneath it and can be seen through the vellum. The gallery version is packaged in a sleek and sophisticated black aluminum box with a satin sheen, lined with luxurious Japanese silk, and each plate of abstract art is printed on heavy acid free archival quality paper. To emphasize the preciousness of its contents, the gallery version is then inserted into a custom fit heavy black protective envelope made of extremely durable nylon fabric with a zippered closure. The gallery version will only available by custom order through our online store and requires the time necessary to both make and ship your order. For those who would like to read the poem and leave to their own imagination the images it conjures up, the text-only version was created. Read in this way, the reader can tap into the author's original conception of the poem and experience fully the power of the written word. 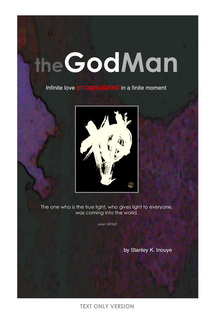 The text-only version of The God Man Poem is now available on Amazon.com. A DVD version of The God Man Poem was never thought to be within the realm of possibility when we first began this not even "low-budget" but rather "no-budget" project. But it was God's vision and will that friends representing different networks of relationship among the Iwa staff would willingly offer their gifts, talents and experience to transform The God Man Poem into a professional quality DVD of pure beauty and excellence. We expect that, when you view for yourself the following excerpt clipped from the middle of The God Man Poem, you too will agree that it is an amazing way to experience an overview of the Bible as the story of Christ's creation. The DVD version is presently in the final stages of production and will be available through our online store. After the DVD version of The God Man Poem was produced, it was only a short time later that the CD version was able to be produced and made available because it is simply the sound track of the DVD.You are welcome to listen to the CD version of The God Man Poem from start to finish on our website right now, and will be able to download a copy from iTunes or order a disc copy for yourself or as a gift through our online store.